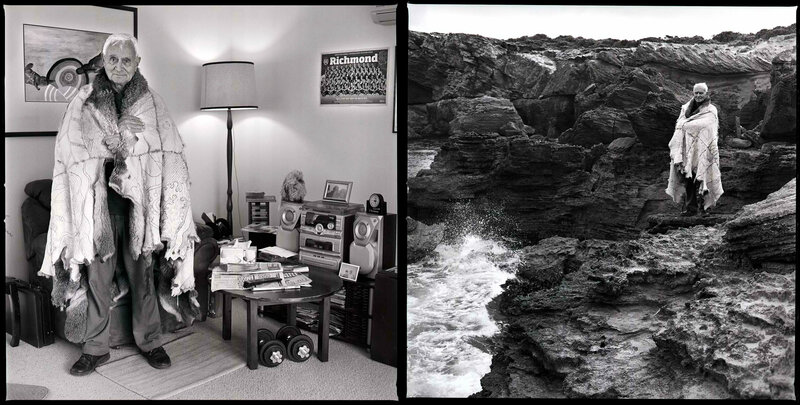 Home / On Country: Gunditjmara Elder Ivan Couzens, silver gelatin print, 60x60cm, Koorie Heritage Trust, 2011 Gunditjmara Elder Ivan Couzens surrounds himself with photographs of his grandchildren and Richmond AFL souvenirs in his Warrnambool townhouse. Even though he spent his early years on the Framlingham Mission and schooled his children in the city of Warrnambool, he has always identified strongly with his Country on the Western District of Victoria. Uncle Ivan, known for his prowess on the football field, stands proud and strong on Thunder Point, overlooking Bass Strait. He has spent his life devoted to the Western District, championing stories about his Old People and actively keeping his ancestor's language alive. He compiled the Keerray Woorrong and related dialects dictionary, published by the Victorian Aboriginal Corporation for Languages (VACL) in 1996. Uncle Ivan enjoys sharing stories about his ancestors, which inspired his daughters Vicki and Debra Couzens to start the possum skin cloak movement with Lee Darroch, Treahna Hamm and Maree Clarke. As a respected cultural leader, he wore the Djargurd Wurrong cloak at the opening ceremony of the Melbourne Commonwealth Games in 2006. The cloak was made by his daughter Vicki Couzens and grand-daughters Yarran, Jarrah, Marlee, Niyoka and Kirrae Bundle.